Jesus Luzardo does not have any MLB stats for the season. Draft: 2016, Washington Nationals, 3rd rd. Jesús G. Luzardo was originally signed by Washington scout Alex Morales…graduated from Stoneman Douglas (FL) High School…went 4-0 with a 0.66 ERA in four starts as a senior in 2016 before undergoing "Tommy John" ligament replacement surgery on March 22, 2016…the surgery was performed by Dr. James Andrews. fewer 15 times and had more strikeouts than innings pitched 14 times … was named the A's number one prospect by Baseball America following the season…was listed number seven on Baseball America's Top 100 Prospects listed and number 14 by mlb.com. the season Aug. 24 at Memphis. 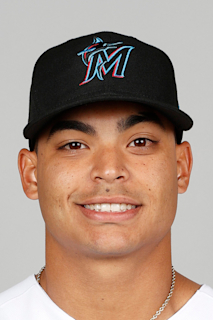 January 24, 2019 Oakland Athletics invited non-roster LHP Jesus Luzardo to spring training. August 31, 2018 LHP Jesus Luzardo assigned to AZL Athletics from Nashville Sounds. August 5, 2018 LHP Jesus Luzardo assigned to Nashville Sounds from Midland RockHounds. April 24, 2018 LHP Jesus Luzardo assigned to Midland RockHounds from Stockton Ports. April 2, 2018 LHP Jesus Luzardo assigned to Stockton Ports from Vermont Lake Monsters. February 23, 2018 LHP Jesus Luzardo assigned to Oakland Athletics. December 17, 2017 Aguilas del Zulia released LHP Jesus Luzardo. December 4, 2017 LHP Jesus Luzardo assigned to Aguilas del Zulia. August 10, 2017 LHP Jesus Luzardo assigned to Vermont Lake Monsters from AZL Athletics. July 19, 2017 LHP Jesus Luzardo assigned to AZL Athletics. July 16, 2017 Oakland Athletics traded RHP Ryan Madson and LHP Sean Doolittle to Washington Nationals for RHP Blake Treinen, LHP Jesus Luzardo and 3B Sheldon Neuse. October 4, 2016 GCL Nationals activated LHP Jesus Luzardo from the 7-day disabled list. June 24, 2016 LHP Jesus Luzardo assigned to GCL Nationals. June 20, 2016 Washington Nationals signed LHP Jesus Luzardo.